Timothy Callahan, center, told The Lima News his goal is to use the Lima African American Chamber of Commerce to help black-owned businesses find long-term success. Pictured is the first LAACC general body meeting, held at the Bradfield Community Center in March. The group plans to meet the fourth Wednesday of each month. LIMA — Lima African American Chamber of Commerce President Timothy Callahan doesn’t expect immediate results. But he hopes advocating for the needs and interests of black-owned businesses in Lima through the LAACC will lead to economic advancement in the black community here. “We want to make some small change results at the beginning, but we’re trying to get minority businesses to succeed long term,” Callahan told The Lima News. “We’re not trying to have a two-year business, we’re talking 10-15 years where a business can build wealth, have employees that are getting benefits and retirement plans. How the LAACC will achieve those goals is still under consideration. 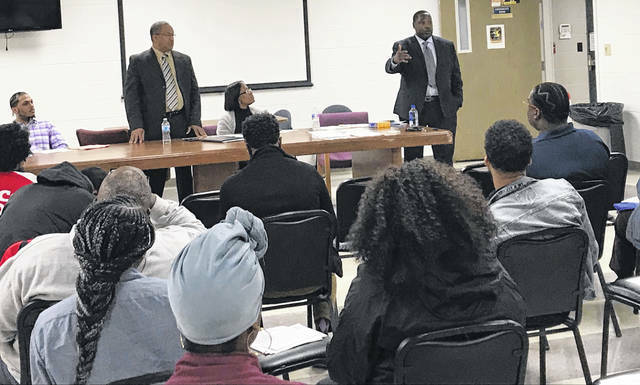 The chamber group, which held its first general body meeting in March, plans to follow the Toledo African American Chamber of Commerce model, which focuses on public policy, business development, workforce development and community engagement. Only 19% of businesses in Lima were minority owned as of 2012, the most recent year for U.S. Census data on business ownership. But 25.6% of the city’s population is black, according to the July 2018 American Community Survey by the U.S. Census. LAACC members hope to use the new organization to advocate for those black-owned businesses and help aspiring entrepreneurs find success. Part of that involves business support and networking, similar to what other chambers of commerce offer. But there will be other work tailored to the needs and interests of black-owned businesses. JaMesha Williamson, legal counsel for the LAACC, pointed to major projects underway in downtown Lima as one example. Williamson hopes the LAACC becomes a resource for minority business owners to better understand the bidding process so that their contracts are considered equally. There will be a policy side too, as the LAACC is applying for 501(c)6 status. “We want to be able to talk from a policy standpoint about what Lima needs for economic development and make sure we’re advocating for the right candidates to be in those positions,” Williamson explained. But Callahan said the LAACC is “still in the learning stage,” with many policy details yet to be determined. LAACC leadership hopes to fill what it described as a void in support for minority businesses in Lima. In one example, members described instances in which they were referred to the Minority Business Assistance Center in Toledo, rather than receiving help here in Lima. The Lima/Allen County Chamber of Commere is a satellite location for the Toledo Minority Business Assistance Center. “We want to bring (those resources) here,” said Jason Clemons, the LAACC’s vice president. Clemons, who owns Kingsmen Wireless on South Main Street, said he waited for weeks after he contacted the Toledo Minority Business Assistance Center when he first opened his own business. That made it difficult for him to navigate basic questions like how to apply for credit. “I had to go on my own, basically,” Clemons said. But more generally, Callahan said some members of the black community didn’t feel the Lima/Allen County Chamber of Commerce met their needs. While the Lima/Allen County Chamber of Commerce offers some resources for minority businesses, the organization has largely relied on the Walter C. Potts Center and Small Business Development Center at Rhodes State College for help. “The Potts Center has been around for a long time, but it hasn’t really been active in many years. … We realize this gap, and there’s been a void,” Jordan said. She said the Potts Center is undergoing change as the organization “revamps” itself, pointing to the recent startup classes offered in conjunction with the small business pitch competition. The Potts Center will also present a minority and small business expo at the end of the month as part of the Lima/Allen County Chamber’s monthly Great American Sunrise networking breakfast. Parties with LAACC, Lima/Allen County Chamber of Commerce and the Potts Center have all indicated an interest in collaborating in the future, although it is presently unclear what such a partnership would look like or whether collaboration will happen. Similarly, Heather Jordan said she’d be willing to work with the LAACC in the future. In launching the LAACC, Callahan has taken pains to emphasize that he is not opposed to the Lima/Allen County Chamber of Commerce or the Potts Center. “We’re not trying to get into an us vs. them situation,” he told The Lima News. He said he would consider working with the Chamber “as long as it’s a legitimate relationship,” but Callahan also said he has not yet received an invitation from the Potts Center or Lima/Allen Chamber.